The wonderful Alison Peebles is at her feline best in David Cosgrove's traditional yet rollicking play, riffing on the role of the actor, and the ethical issues of how far to push the audience. Her character Betty is a glamorous but exhausted psychic of the old school, all flashing eyes and fed lines about 'Mary being at peace now', with a nice array of wigs and sparkly frocks. Seemingly, the only spirits she has ever really seen come in a glass with lemon and tonic water. Gemma Patchett's lovely showbizzy set design, with red curtains and Judy Garland photo, even has a reference to Wildcat Theatre, as it features two of their posters ,a nice doff of the cap to David Maclennan, late founder of PPP. Betty's long-suffering, cynical assistant Siobhan (Neshla Caplan) who is debunking the techniques used at the side of the stage, is rather tiring of her not sticking to the script – and neglecting to mention her exclusive merchandise in the lobby – when an interloper, Mark, (Andrew Still) threatens to expose Betty for the phony he reckons she is. As he has requested a personalised reading, post-show, he wants some answers that don't come from an ear piece. Libby McArthur's sharp direction keeps the play pacy, and the barbs about gullibility and culpability, and 'wee baldy shite Derren Brown' mean the twists are satisfying – even if you can see a couple of them coming without the aid of a crystal ball. 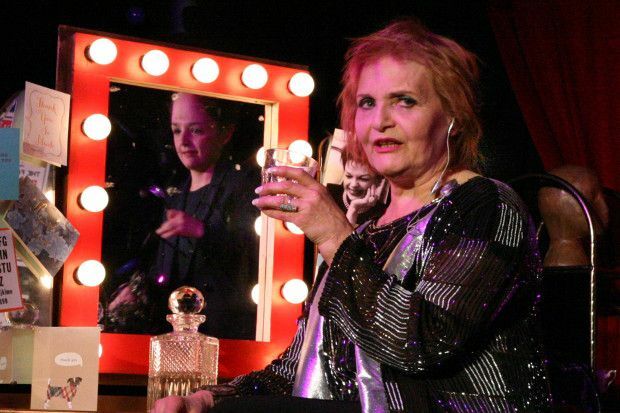 Oran Mor, Glasgow, until April 22; Traverse Theatre, Edinburgh, Tue 25–Sat 29 Apr. When clairvoyant Betty decides to retire after 30 years her employees aren't happy that she's shutting down their highly profitable scam. Written by David Cosgrove and directed by Libby McArthur.